Do you want to renovate your Blogger Template by adding a Cool CSS3 Round Border to it? Though, Blogger is not famous for its customizing and optimizing but still we can make a masterpiece with it. Everyone loves simplicity, but it is essential to have a spotless theme that reflects professionalism. 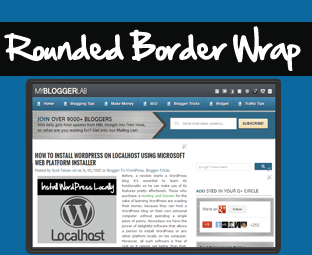 By adding Round border to blogger template, a person adds more spice to his blog. Moreover, he can even add multiple backgrounds that will surely amuse his readers. Therefore, after receiving lots of requests from our readers today finally we are sharing our CSS3 Rounded Border Wrap for Blogger enable websites. How many people’s brains are unclear that whether their site fits the resolution of some old monitors? By saying that we are living in the modern era, a person is running away from the truth, and that is most people are still using old monitors to browse the whole internet. If a Person has decent traffic, then the probabilities are particularly on a higher side that most of his visitors are browsing his website through their smallish monitors. Since, his site is design for large screen monitors so it would not fit smallish monitors. Therefore, it is essential to add a wrap border to your templates that automatically fits the screen of large and small monitors. The steps mentioned below are extremely straightforward all you need to do is to follow them as it is. It would hardly take 5 minutes to complete the integration. Do as mentioned below. Now Press Edit HTML >> Proceed. Then within your template search for ]]></b:skin> and above it paste the following CSS3 Coding. Now once again in template search for <body> and just below it paste the following HTML code. Last but certainly not the least search for </body> and above it paste the following HTML code. All Done: That’s it save your Template, and CSS3 Rounded border WRAP is set up to your blog. Now go ahead enjoy the picture perfect results. Note: This plugin is made by the MBL Developers, so don’t replicate without the permission of the administrator. .
Hope you have enjoyed our personalized Wrap Widget. It’s been a while now that we haven’t shared any Blogger Templates. Therefore, our developers are trying their level best to formulate a masterpiece. There are some surprises coming up so stay tuned. Take a lot care of your family till then, Peace, Blessings and happy Wrapping. Nice tutorial and great advice but iif i want to use a curly design border ? İs this posible and how? Thankyou !!!!!! It bought a very compact look for my blog !! Nice Tute. why you used mozilla prefix -moz-border-radius:10px; ? It is now obsolete. And I want to write a Guest Post in your Blog, How can I do that? Is to possible to do with word press? Thanks a lot for sharing this...it works perfect. Keep it up! i can not find body starting html tag in my tem. Syed This is simply awesome Thanks !!! <body and paste the Coding when it Gets end. I have added this to my blog but i think my menu is somehow distrubed.Can you please check out what may be the problem. The element type "body" must be terminated by the matching end-tag "